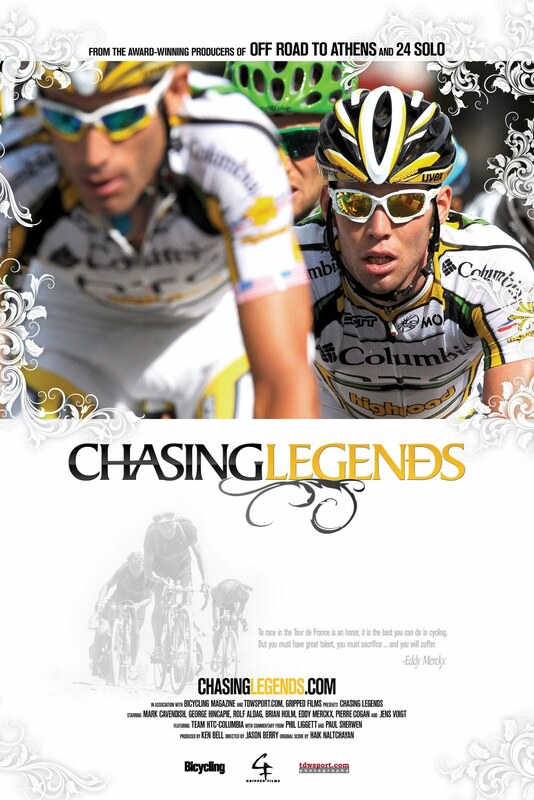 May 2010 saw the theatrical release, on a very limited basis, of Chasing Legends, a documentary about the 2009 Tour de France seen through the pro team HTC-Columbia, led by super-sprinter Mark Cavendish. The movie is now out on a 2 disc DVD set and my review of it has just appeared at Pezcyclingnews.com and can be found here. The film was produced by a group based in little Harrisonburg, Virginia in the Shenandoah Valley and on a shoestring budget. A labour of love, it is certainly worth adding to your collection. Great review on Pez but the sad thing about this movie is that it has had a very limited (by both country and number of showings) theatrical release and despite being touted as a "High Definition" Documentary there is no immediate plan to release a BluRay version (I have asked them) so it's just a plain vanilla DVD. Unfortunately, I think the economics of film-making are such that cycling films are pretty close to unsellable. Alas.